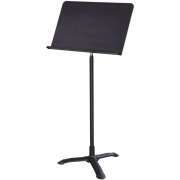 Promote successful rehearsals and performances with music stands from Hertz Furniture. Whether your student musicians are beginners or advanced players, they need a proper place for their music. Sheet music stands ensure that the band can stay on key and play in harmony. Start off on the right note by providing budding young stars with user-friendly furniture for the music room. Where can you get the best music stands? Give your artists the tools they need to succeed with Hertz Furniture&apos;s music sheet stands. Whether you are hosting group music lessons or putting the finishing touches on a long-awaited performance, they are truly the best. Why do you need a music stand? Whether musicians are in a seated or standing position, it can be quite challenging to read musical notes from a flat surface. While a regular table or desk can support sheet music, it is hard for a student to keep hands properly positioned on the instrument while maintaining full view of the notes. When children or young adults start off learning to play with incorrect positioning, it will be hard for them to break these bad habits later on. However, if you purchase the sheet music stands that will enable students to play properly, you will encourage students to continue playing, while demonstrating the importance of arts in education. 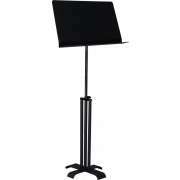 You can help violinists, cellists and flutists play correctly from the start with proper sheet music stands. Adjustable-angle reading surfaces enable each musician to position music at the perfect angle for easy viewing. When the reading surface is properly-positioned, it is easier for the players to keep their hands on their instruments as they play. Our music stands have reading surfaces with adequate weight capacity to hold the sheet music that is generally needed in a concert or practice. How do you adjust a music stand? In addition to setting the reading surface at a comfortable angle, there is another necessary adjustment that is required for correct positioning of a music stand. Especially when you have musicians of various ages, adjustable-height music stands are essential. Make sure that adjustments are smooth, easy and secure. It can be quite disruptive to playing if there is constant sliding during a performance and musicians are continually readjusting equipment. Improper music stands will be distracting to both fellow players and the audience. 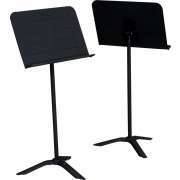 Which sheet music stand should I get? When you want to bring music into the educational environment, it is important to do so with proper high-quality equipment. Music holders from Midwest Folding Products have a precision clutch mechanism which securely maintains the desired positioning. The easy telescoping adjustment won&apos;t collapse, and a strong reading surface can hold up to eight pounds, so you can fit the whole score easily. Another great option is the sheet music stand from National Public Seating. This sturdy model is designed to remain firmly in place throughout the whole evening. A spring-loaded pole facilitates smooth, quiet adjustments, so no distracting sounds will break the silence or interrupt the concerto. 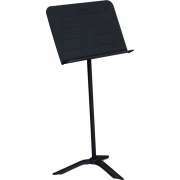 Does the conductor need a special music stand? Like the musicians that he or she is leading, the band leader or conductor needs a place to keep sheet music to make sure that everyone is in the right place for harmonious playing. A regular music stand just might not cut it for an eminent maestro who needs to have a clear view of all parts of the score. Our conductor stands are designed to handle lengthy scores and multiple pieces of music, so a band director can easily see all parts of the harmony. The increased weight capacity and super-stable supports of our conductor music stands let you keep up to three full scores right where they are needed. What is the best way to move and store music stands? Although music stands tend to be lightweight, moving them individually can be quite a hassle, especially when arranging a space for a full orchestra. 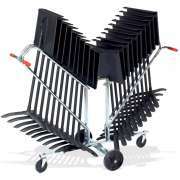 If you need to get your music equipment set up or cleaned up in a flash, music stand carts can really come in handy. Transportation devices that are designed for particular pieces of equipment reduce the risk of damage from dropping or bumping. Don&apos;t waste your time trying to fit your music holders on an inappropriate cart. Music stand dollies are a worthwhile investment you won&apos;t regret. 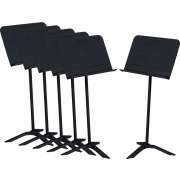 Whether your student musicians are part of a choir, orchestra, band, ensemble or solo act, they are sure to benefit from stable, visible music stands. Hertz Furniture&apos;s music sheet stands are designed for easy adjustments that will remain in position throughout a full performance. 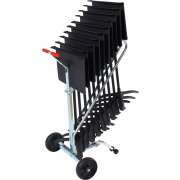 So, strike up the band and encourage your students to develop their talents with our great sheet music stands!